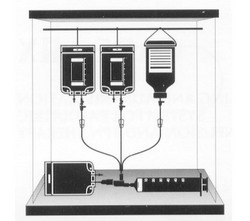 The FMS 2000 infuses blood or crystalloid warmed to physiological temperature at rates from 2.5 - 750 ml/minute. Unlike simple warmers the FMS 2000 is a self-contained fluid management system: patented induction heater, volumetric infusion pump and safety sensors are all contained within a single compact 26 lb. unit. Instant heating, a complete range of calibrated infusion rates, bolus infusion capability and advanced air bubble, temperature and pressure detectors make the FMS 2000 the safest and most advanced IV fluid management system available. A & A Healthcare this name designates itself in the field of Critical Care equipment as a foremost company in introducing the most modern & cutting edge equipment to the Indian healthcare industry. Having our registered office in New Delhi (INDIA), we hold significant sales & marketing teams all over India. Many renowned medical practitioners have helped us in promotion & placement of our products. We value their belief in us and remain committed to maintain their confidence in our equipment, service & after sales support.